B&B's intelligent Streamers extract and translate the complex OBDII data from the vehicle bus and convert them into easy-to-use parameters, allowing Telematics Service Providers to focus on developing best of class applications. 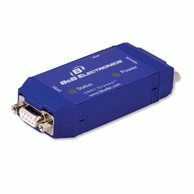 -The B&B Electronics AutoTap™ OBDII Data Streamer Model LDVDSV2 connects your PC, driver terminal, Java-enabled phone, or other on-board computing device to the OBDII diagnostic bus of light and medium duty vehicles. It enables the retrieval of the most commonly used parameters of value in telematics and fleet management applications. -The LDVDSV2 provides a simple operational protocol to communicate to the OBDII bus. It provides a common interface and deterministic response time for all vehicles.